The Discovery Tab is located to the upper right of the Document Viewer. This is the discovery production information including data that you have added to the database in Lexbe eDiscovery Platform to describe or annotate the document. You can prepare documents for a discovery production and display within Lexbe.com (discovery production page). 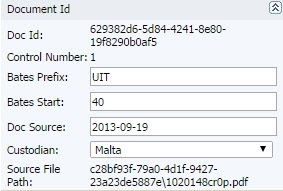 1-Doc ID: This is an internal string of numbers automatically generated to keep track of each file uploaded/processed, GUIDs that allows files to be tracked back to the computer that created. 3-Bates: Bates numbering is a system of sequentially numbering document pages in paper or electronic form as part of litigation discovery to uniquely identify each page scanned or processed. 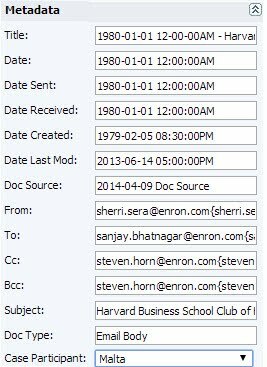 The Bates Section allows you to add or edit the Bates number of a document. Bates numbers are viewable from the Browse and Search pages and can be printed on PDF documents as part of a production. For more details, click here. Bates Prefix: Bates prefix refers to the alphabetic prefix that makes up the first part of a Bates number, which might include text such as a set number, case number, or firm name. Bates Suffix: Bates suffix indicates the number of digits of the Bates designation. This should be 1+ the last Bates number assigned in previous Bates numbering. If you selected to continue an existing range, this is auto-filled. Bates Start: Bates start refers to the number of the first page in the document. You can assign Bates numbers in several ways. First, you can manually enter Bates numbers here per document. Secondly, you can add Bates numbers in bulk as part of a production. Finally, Bates numbers can be associated with documents as part of import of a load file. Custodian: You can assign Custodians/Case Participants to a document. Source File Path: This built-in field includes the disc path, files and directories, along with namespaces which refers to the Folder Path within Microsoft Outlook keeping folders and sub-folders information. 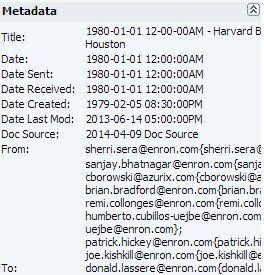 It is named after the original sender of all email data. Discovery tab provides rich functionality for adding and organizing document information. It is also organized in sections and fields, that will be discussed in details. Responsive. Checking this enables you to mark a document as responsive or non-responsive to a discovery request. If marked 'Responsive', the user may specified to whom it can be responsive. The document will be displayed in the discovery production page. Attorney-Client Privilege. Checking this enables users to insert the text 'Confidential' in a document and protect certain communications between a client and his or her attorney and keeps those communications confidential. The document will not be displayed in the discovery production page; only in the privilege log. Attorney Work Product. 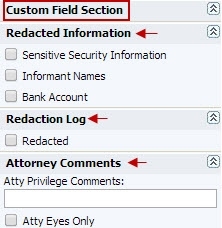 Checking this enables you to protect materials prepared in anticipation of litigation from discovery by opposing counsel. These rules vary by jurisdiction. 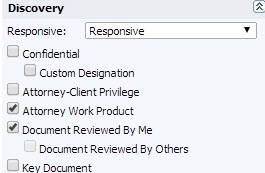 The document will not be displayed in the discovery production page; only in the privilege log. Confidential. Checking this enables you to indicate which documents that required you to hold in strict confidence all information concerning the business and affairs of your client. The document will display in the discovery production page but will indicate the confidential nature of the document. 'Custom Designation'. Checking either of theses enables you to mark a document as confidential as may be contemplated under a litigation confidentiality, and 'Subjective to Protective Order' or 'Attorney Eyes Only' agreements. The document will display in the discovery production page, but will indicate the confidential nature of the document. The Custom Designation tag is equivalent to the 'Confidential' and 'Attorney Eyes Only' tags in Lexbe eDiscovery Platform and it allows you to enter full text messages usually up to 100 characters (e.g. Confidential Subject To Protective Order). Documents Reviewed By Others. Checking this enables you to display if a document was reviewed by your litigation review team. You can see who reviewed and filter by in the 'Browse' tab, but you are not allowed to change it. Document Reviewed by Me. Checking this enables you to display only by Main Lexbe Account Manager. Is Key Document. Indicates the most relevant documents to be produced. The the tags displayed under the Metadata fields are 'read-only' for Standard Users and edit rights for Account Admin Users. This section also allows you to assign existing Case Participants to selected documents.